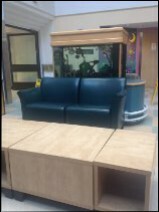 I have passed this fish tank many times before, when dropping patient’s off at the U of A or picking them up to fly them home. I’ve laid on these couches to catch a 10 minute power nap when I was in the middle of what seemed like a never ending stretch of flights. I did not know then that this is the waiting room for the PICU and the cardiac PICU. I did not know that one day I would be sitting at this fish tank while our son is having open heart surgery. I did not know that at this fish tank is where we would wait patiently for the surgeon to come tell us that our baby is safe and all went well. And here we are…. After second bath and last bottle we all crawled into bed around midnight. Surprisingly we all had a pretty decent sleep, despite a hungry baby and what today was going to bring. We got up at 5am, gave Jaxson his third and final bath and hit the road to the hospital. 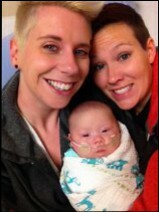 This morning was uneventful, we got to the pre admission clinic and sat on the bed and snuggled with our boy. At 0710 the porter form the OR came down to fetch us. We sat with Jax in the OR waiting room for a few short minutes until the anesthesiologist came to brief us. They then whisked him away…..
We now sit patiently at the fish tank and try and pass the time. I am thankful that this little waiting area is open to a main/busy hallway. There is lots of people watching, noise and distraction. We were told to be expecting a 4-5 hour wait from the time we handed him over to the time we are by his side in the cardiac ICU. In the meantime we drink coffee, shop online and maybe put a movie on.